Radhanath Swami – Superb article on how to remain positive in negative situations! Comment on Always Positive by Kalpana Kulkarni. Superb article on how to remain positive in negative situations! The determination to never give up despite having obstacles is the stepping stone to success. The ultimate secret of that positivity lays in seeing the merciful hand of God acting through everyone around and through every aspect of life – Wonderful inspiring words! Amazing article! Gives us insight about rituals and how we should understand the meaning behind these rituals which ultimately help us in purifying our consciousness. Being committed to a particular spiritual path yet being able to appreciate other paths and religious leaders is a hallmark of a great devotee. God – the greatest or the sweetest? God is both great and sweet and his pastimes illustrate both these aspects! In our times of crisis, it is only hope and surrender that can save us! The hallmark of all great souls is to appreciate all religions and realize that the essence of all religions is the same. To pray needs a humble heart, and humility is the greatest virtue valued by GOD. Radhanath Swami by his desire, ability, eagerness, and knowledge to pray shows us how close he is to the instructions of GOD. Its really true , Prayers give us a lot of morale boostup from inside and have personally realised this power of Prayer number of times. But yes Maharaj incident teaches how and what to pray for. Praying to Lord gives lot of satisfaction in this world.Thanks to Radhanath Swami. radhanth swami shows by his example that faith can move mountains he had faith in his mother that god loves him and that faith has took him to the position of divinty. Nice level of information here. There is so much data around about this subject that sometimes you cannot see the wood for the trees but you have pitched this at just the right level so that the lay person can understand – thank you! To make our dreary lives simple,sublime and gay! Hey very nice blog!! Man .. Beautiful .. Amazing .. I will bookmark your blog and take the feeds also…I am happy to find so many useful information here in the post, we need develop more strategies in this regard, thanks for sharing. . . . . .
Prayers cuts the distance between oneself and God. radhanath Swami habituated since tender age to pray. He is really a great spiritual man. All glories to Radhanath Swami. Radhanath Swami is a real saint who has come out of his comfort zone to save us from the onslaught of this material world. Thank you Radhanath Swami. Power of Prayer….Radhanath Swami always prays for the well being of everyone. That is his greatness. Power of prayer is always taken lightly due to lack of faith. But through this article Radhanath Swami gives a new surge of faith. Thank you Radhanath Swami for instructing us on the mood to be followed while praying. Thanks for sharing, we can peep into Radhanath Swami’s heart and his feelings through his prayers. He truly is everyone’s well wisher. thank you very much Maharaj!!! Power of prayers! really amazing. Prayers are indeed the most powerful tool & medium to express our heart our beloved Lordships ! As its said “Prayers go up, Blessings come down”. Thank you for showing us the power of prayers. Hare Krsna ! very nice article. Thank you for sharing its enlightening. Radhanath Swami is constantly remembering Krishna and help others also remember him. Its due to the intense desire to bring everyone out of the fire of material existence, that Radhanath Swami is making the time to preach to everyone. His heart is very merciful. Prayer enriches our hearts with God’s presence and brings deep, lasting fulfillment, thus enabling us to have smiling hearts and smiling faces – wonderful lines! power of prayer- a tool to perceive God’s presence in our lives and touch Him with our thoughts. What a wonderful definition of prayer! Usually all of us pray for material things like wealth, good job, nice spouse, etc and we also make deals saying that if we get what we ask for, then we will donate coconuts or feed brahmins, etc. But that is not what we should pray for. We should pray out of love and a sense of gratitude. We should pray for his love and blessings. 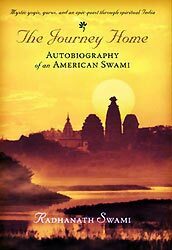 ‘The Journey Home - Autobiography of an American Swami’ Book is an engaging, humorous and heart-warming account of a young nineteen year old’s quest for spiritual enlightenment. 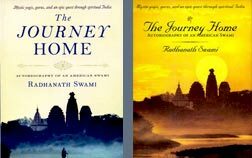 The reader follows Richard Slavin (Now Radhanath Swami) from the suburbs of Chicago to the caves of Himalayas as he goes through a variety of exciting adventures; some near-death encounters and many spiritual experiences. Regular reading of this all-time classic has helped me draw spiritual lessons and seek constant inspiration in my own spiritual journey. 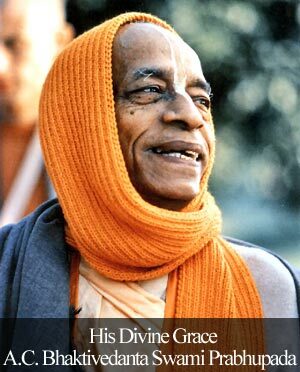 Teachings of Srila Prabhupada can be found at www.prabhupadavani.org. Teachings of Radhanath Swami can be found at www.radhanathswami.info. Radhanath Swami travels around the world and frequently lectures throughout the United States and Europe. He is based at Radha Gopinath Temple in Mumbai, India.